Awesome to the rescue! Captain awesome stands for more than just a great smile! 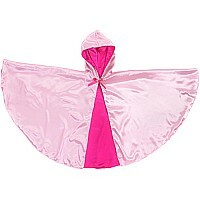 this cape on gives your little one the confidence to be awesome at anything they do and in style! the Captain awesome cape is made with a red satin lining, bias cut binding and has a Velcro closer. Each color cape comes with 8 markers. Best of all, the capes are machine washable!. Measures approximately: 24.50 x 33.00 x 0.50 inches..